A 2006 photo of Lee Edwards III, Lee Edwards, Leon Edwards in an early model Chevy. Photos courtesy of Edwards Chevrolet. 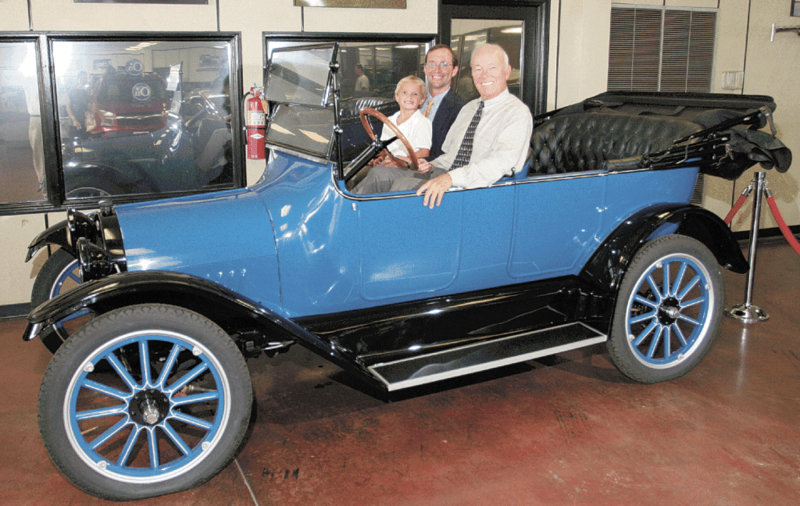 Celebrating 100 years in business is a milestone for any company, but Lee Edwards of Edwards Chevrolet said it is especially impressive for his family’s business. The Chevrolet dealership was established in August 1916, when Sterling Edwards opened the first location in downtown Birmingham on 21st Street. At the time, Chevrolet cars were relatively new on the automotive scene. Without even a high school diploma, Sterling Edwards started selling cars while supporting his family. The business began to grow as WWI approached. After the war, demand for the cars increased and Edwards Chevrolet expanded – opening dealerships in outer areas of town. 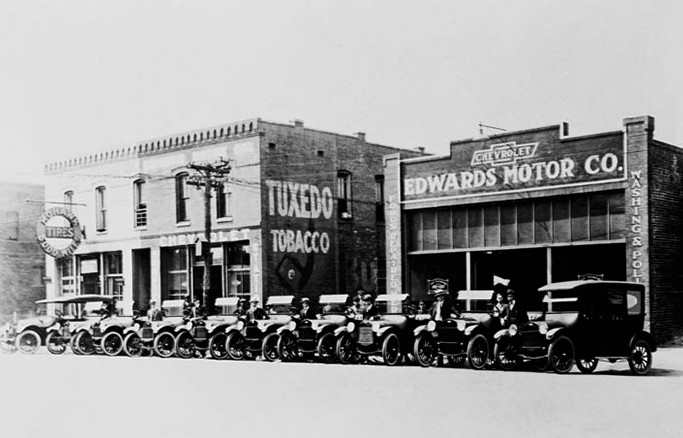 But, as a result of the Great Depression, Edwards was forced to close dealerships and re-centralize operations downtown. 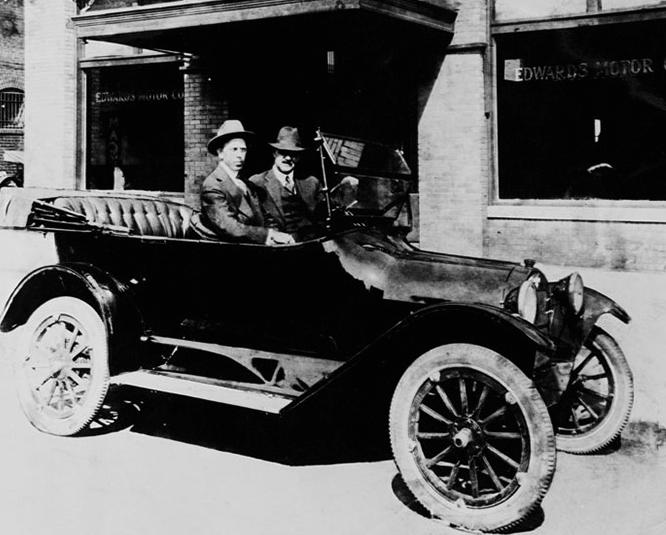 Sterling Edwards takes a test drive with Louis Chevrolet. Without even a high school diploma, Edwards started selling cars while supporting his family. During the time when no new cars were coming on the lot, Lee Edwards said the business relied on the service and used car sides of the business. In 1944, Edwards Chevrolet moved headquarters to Third Avenue North and continued to grow its parts and service division. The dealership continued to thrive even through the Arab Oil Embargo in the ‘70s and the recession in the ‘80s. Today, the dealership has another location on U.S. 280 and employs more than 200 people. Lee Edwards is the third generation to run the business, working along with his father, Leon Edwards. He began working summers at the dealership when he was 15 years old and now he is hoping the next generation will choose to continue the family legacy; his son and nephew are working for the business now. But, he said, just because Edwards Chevrolet is a family business doesn’t mean leadership will put any Edwards in charge. He emphasizes that being a part of the family business is an opportunity that has to be earned, not a gift. When reflecting on the ups and downs of the business’ history, Lee Edwards cites customer service and employees’ well-being as keys to success and longevity. Edwards Chevrolet dealership was established in August 1916, when Sterling Edwards opened the first location in downtown Birmingham on 21st Street. Even with the car buying tools widely available on the internet, Edwards still believes classic car dealerships will be around a long time. Edwards said the business has been able to weather economic hardships and fluctuations in auto trends and he believes the same will be true for years to come. Edwards said that, at its heart, the satisfaction of a job at a respected and established business like Edwards Chevrolet is making dreams come true. The entire Edwards family is taking the month of August to celebrate and appreciate all who have supported them over the years. But, Edwards said that with the celebration comes the acknowledgement that there may always be a tough time around the corner.